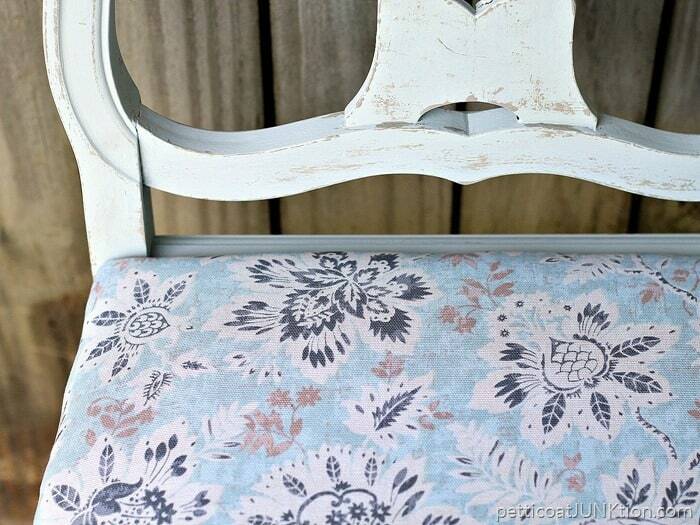 Pre-Mixed Paint Colors Match The Fabric! How about a chalk finish you don’t have to mix up or wax. Don’t you just love a fuss free makeover! I have to admit to crushing over this makeover. I know….I shouldn’t brag on myself. What can I say except the makeover went way beyond my original vision. This piece has been in the workshop for a long time. I think I bought it at My Favorite Junk Shop but I’m not sure. It was in pretty sad shape and the prep work included gluing the loose edges of the detail work and the legs where they meet the seat casing. No, it wasn’t perfect after the prep but I could work with the flaws. The supplies for the project include the beautiful Waverly Inspirations fabric and specially formulated paint to match the fabric. Isn’t that awesome. I love this idea. It means I can select fabric and know there are pre-mixed paints in rich colors to match. No rushing to the paint department at my local home improvement store with fabric in hand. I painted the chair with the Crystal color then layered on a little of the Mineral color using my layering block. I painted a thin layer of Mineral on the block using a brush and went to work. I ran the block over the chair, hitting all the details, including the flaws. I added paint to the layering block as needed. I didn’t go overboard with the layering…just a touch here and there. Next I recovered the chair seat with the Waverly Inspirations Fabric ( style, Petal Spa ). The only thing left to do was to reattach the seat to the chair. 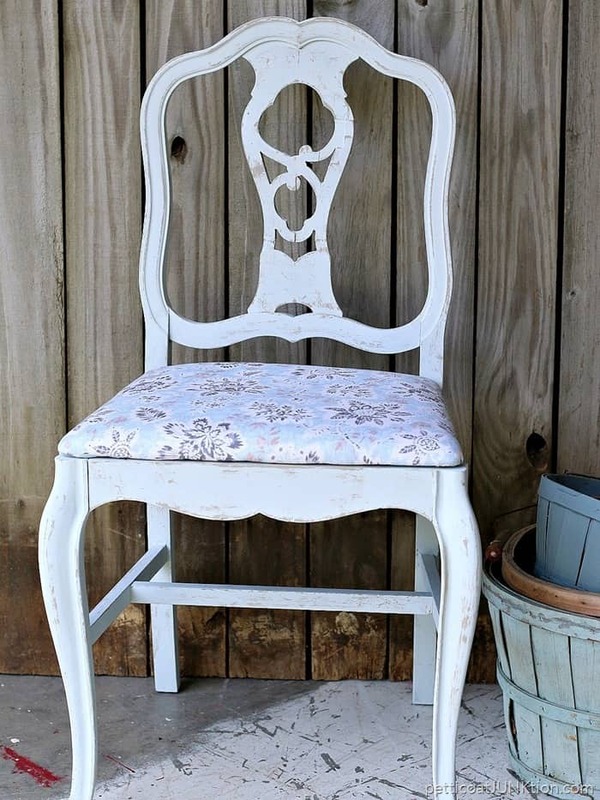 I always tell new furniture DIYers that chair makeovers are the easiest DIY and have a bigger impact than any other furniture makeovers. It’s true! The combination of paint and a new fabric seat cover is hard to beat. The Crystal color is a soft, soft blue. It almost has an iridescent look. The colors match the fabric perfectly. Even the flawed details look pretty with a touch of the soft Mineral color. The matte chalk finish doesn’t require any prep work. 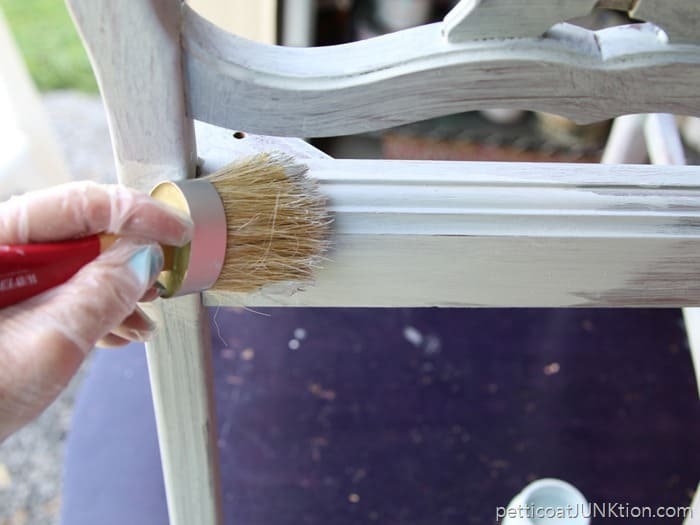 Just clean the furniture and paint it on. I didn’t apply wax either. I would definitely apply wax if the project was a table instead of a chair. 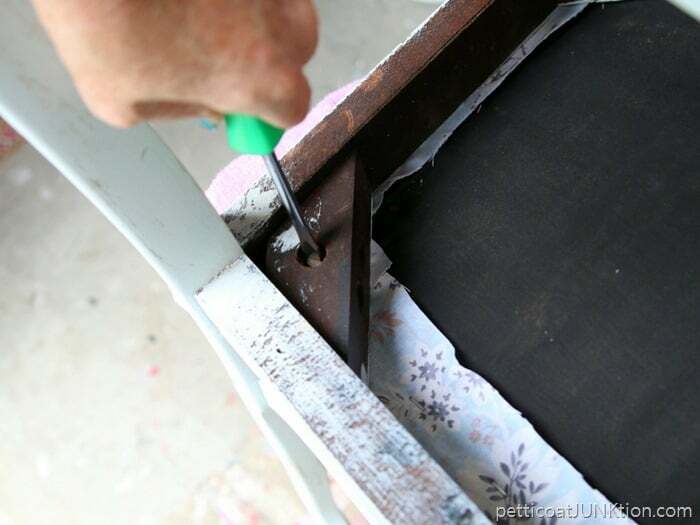 The wax protects the finish and adds a little sheen. I’m thinking Tenley might want this chair for her room. I’ll let you know. Waverly Inspirations is available exclusively at Walmart and Walmart.com. 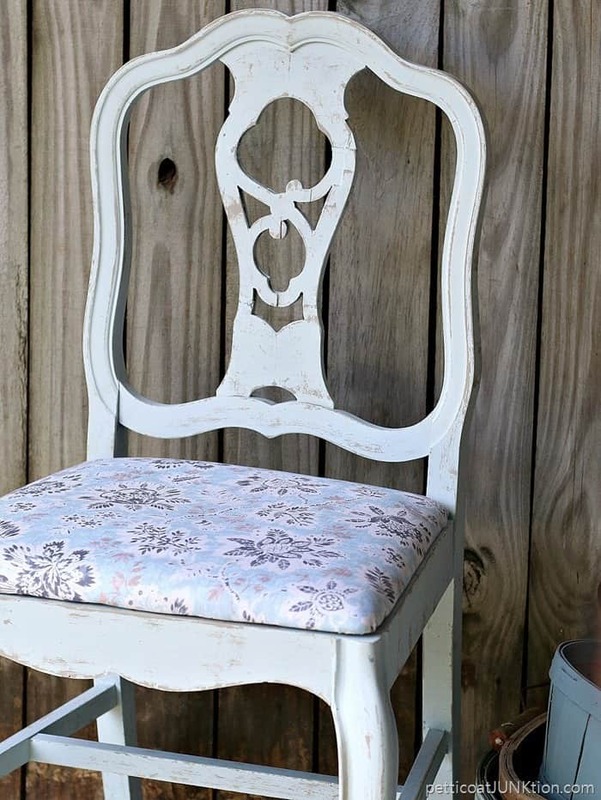 The product line includes stencils, brushes and other tools inspired by the Waverly Inspirations Fabrics. I’m thinking I need a few of those stencils. 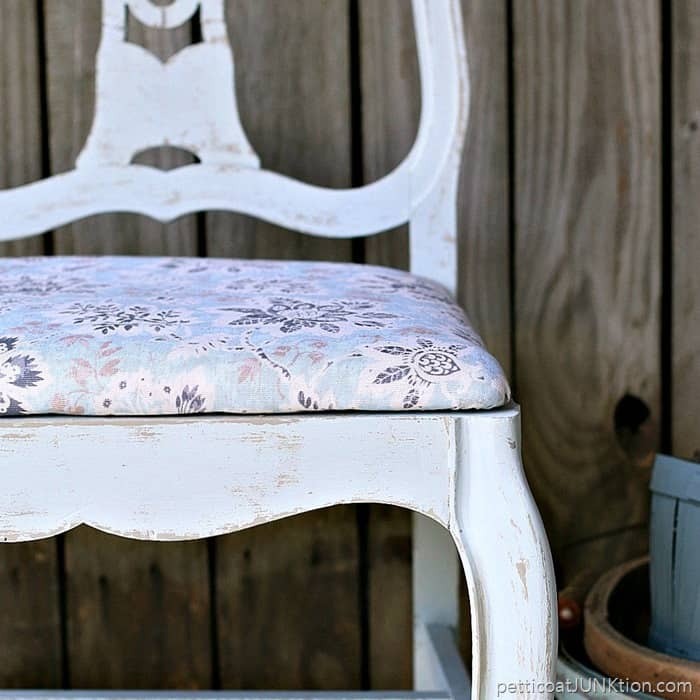 Have you DIYed a chair or do you have a chair that needs some love?? Leave a comment and tell me all about it. Be sure and sign up for the Plaid Newsletter. It’s full of information on new products and fun project ideas. Follow Plaid on Facebook, Plaid on Pinterest, Plaid on Instagram. 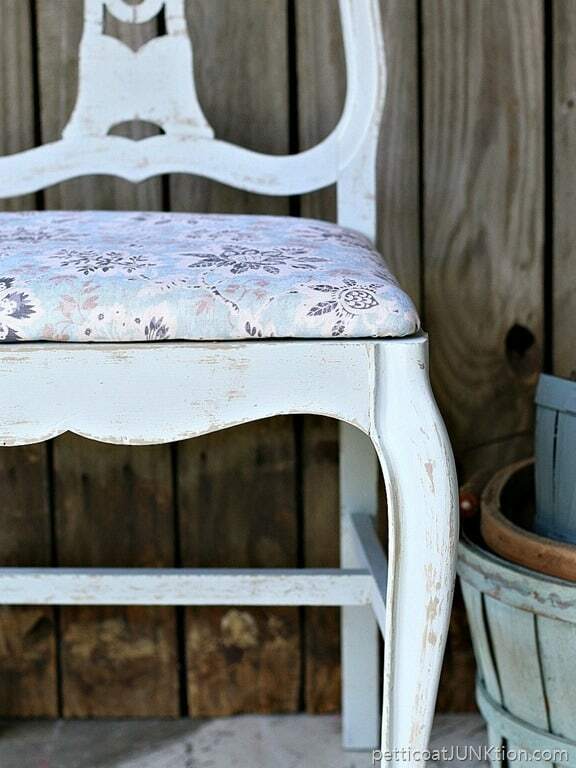 This chair makeover is sweet and soft. 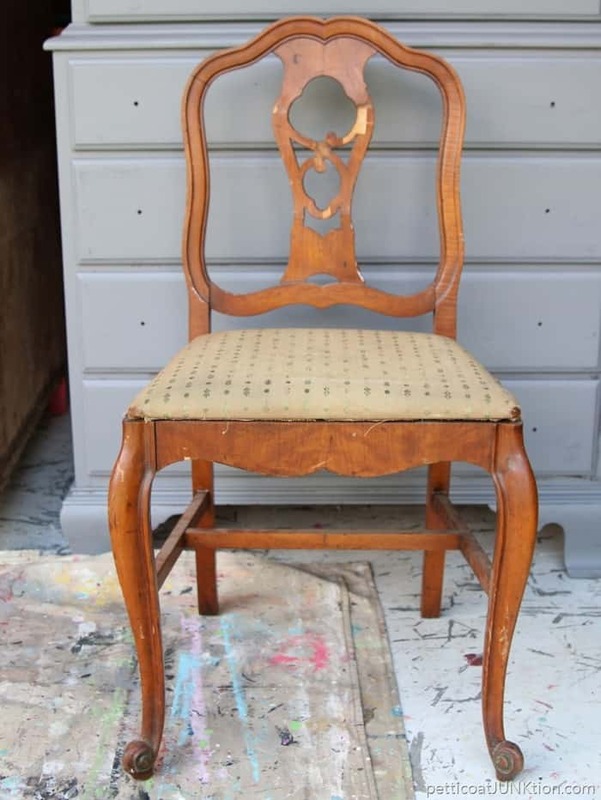 For bold and in your face take a look at another of my chair makeovers…..Bold Yellow Chair. Disclosure: I partnered with Plaid Crafts on this post. All words, project ideas and photographs are 100% my own. This is so cool! 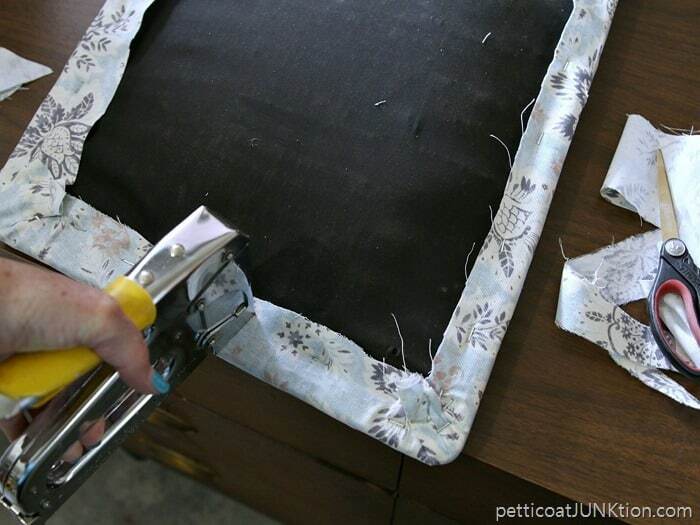 I knew about the fabric but not the matching paint…great tip! Thanks for sharing at Welcome Home Wednesdays! The chair turned out fantastic. I buy the Waverly fabric at Walmart but I didn’t realize the paint was made to match. I will check it out. The paint color and fabric you selected are very pretty. I have no problem going to Walmart and am anxious to check out the Waverly paints and fabric. I have a “soft spot” in my heart for chairs. You have done a beautiful work of painting! I like that you left the little bumps and dings of life unaltered—makes for such a unique piece! The fabric and paint colors are perfection! 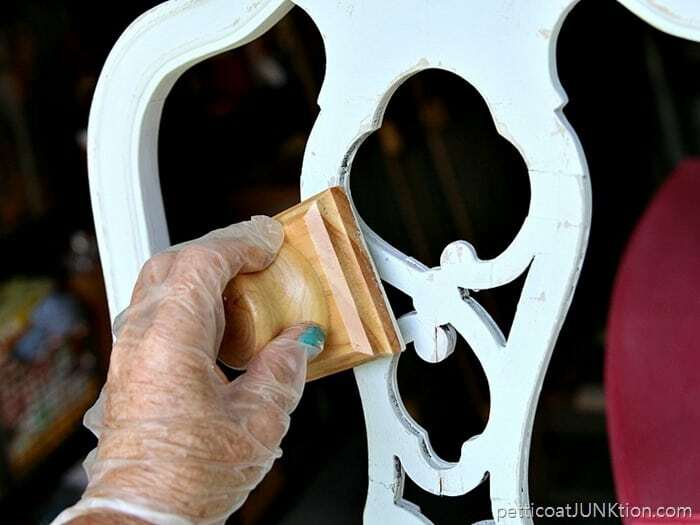 I know I sound like a broken record, but your furniture makeovers are so inspiring! Thank you. This turned out so pretty! Great makeover! LOVE!! I HAD NO IDEA THEY CAME OUT WITH PAINT! What will “They” think of next?!! The Waverly Inspiration line sounds wonderful (but it won’t get me into a Walmart store!). It’s almost fool-proof decorating. Thank you for sharing. Simply gorgeous! Loving the colors, the fabric…all of it! Beautiful job, Bev!!! The chair is beautiful. I really love it. 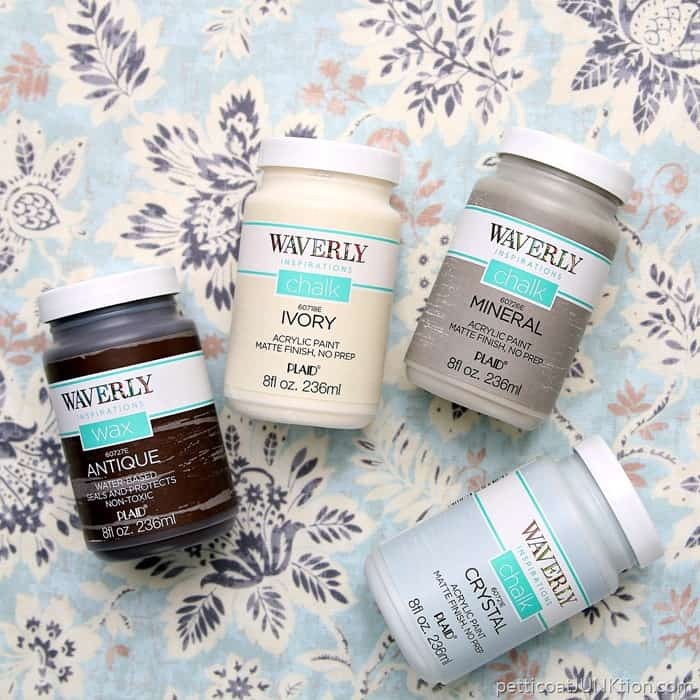 I have been using a lot of these Waverly Chalk paints lately, and they are very good in my opinion. I am just not familiar with the layering block that you mentioned. I have never heard of this before. Can you explain this a little more please? This is such a wonderful idea! Often times it’s hard to find paint colors to coordinate with the fabric I’m using. This takes all the guess wsrk out. I love it!!! Love the chair and the colors. Will try the new paint too. I have a question that is separate from this blog. 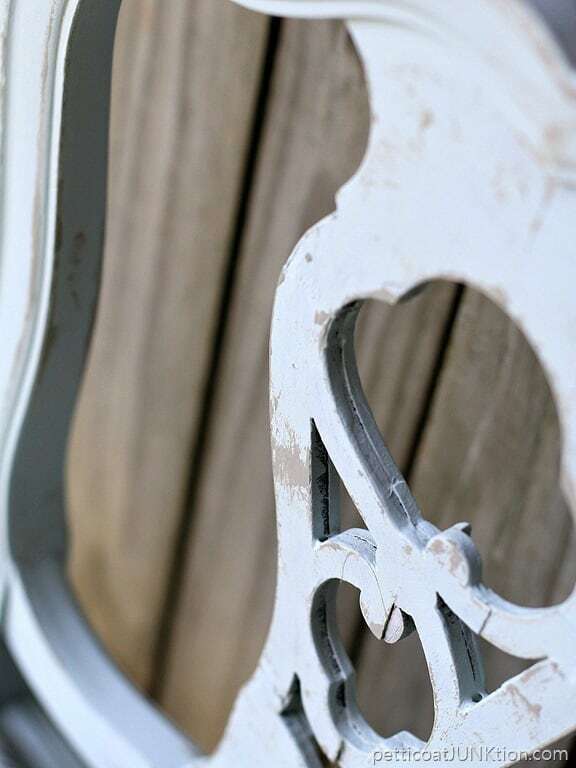 What would you do with very rusty porch railings that were used on a porch. They are horizontal and look like bi-fold panels. Any suggestions or do you need a picture? Thanks. Yes Effie, Please email me a photo! How pretty. Thanks for sharing!!!! I plan to give this a try. Gorgeous!! Thanks for sharing the How To on this!